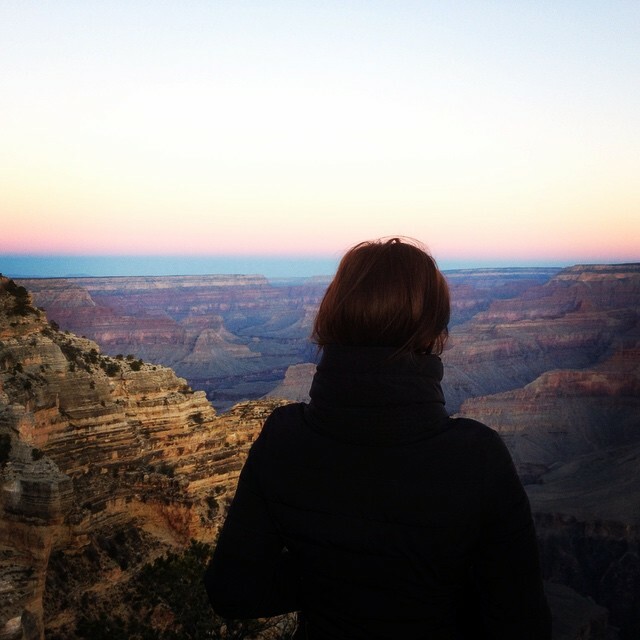 I don’t think it’s quite possible to understand the vastness of the Grand Canyon until you’re standing on its rim at 5am watching the sun pull itself over the horizon and warm the deep caverns and red rock below you. I was lucky enough to visit this wonderful example of erosion earlier this year. My friend Charlotte was visiting from England and what better way for her to see California than to drive immediately out of the state to Arizona. In order to break up the drive from Los Angeles to the Grand Canyon, we decided to stay a night in Las Vegas. A few vodkas, one hundred dollars and four thousand calories later, we left. That night deserves its own post, or perhaps it should be hidden in the vaults of our minds forever. Either way, we were finally on our way to this great big crack in the earth and had no idea what to expect. A few hours in, we ‘stumbled across’ the Hoover Dam. Despite our accents, Brits are not all intelligent. We were both convinced that this monument was on the East Coast. Clearly, it’s not. We shuffled on, never to speak of this mistake again. There are some things that the British will always find fascinating about America, and that is wide stretches of flat land with nothing but roadkill and rocks. The expansive countryside of America is, in itself, breathtaking and terrifying. If your car breaks down in England, you’re probably within farting distance from a pub or a tractor. If your car breaks down in America, you’re screwed. Our brains don’t deal well with these types of distances, which is why we met every gas station as if it were a glorious oasis filled with water and beef jerky. This, I believe, must be the reason behind Bakersfield. We finally arrived at our lodge and headed straight into the dining room for some food. We made the mistake of walking past a notice board covered in flyers. 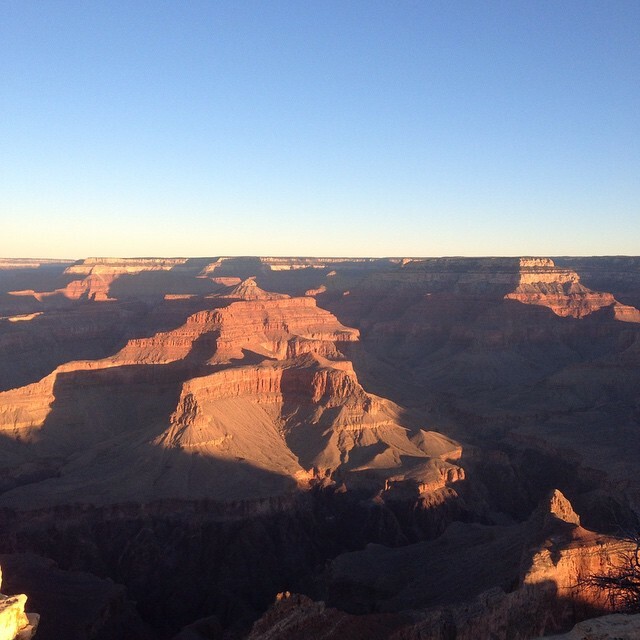 Each flyer outlined in painful detail the potential dangers of the Grand Canyon. There were so many warnings, so many pamphlets, I’m not even sure there was a notice board underneath. It was probably all just held up by fear. I swear one of them was titled, “You’re Going To Die This Weekend, Here’s How To Make It Less Embarrassing’. Charlotte and I stood next to each other and gulped. What had we done. We were clearly entering a death trap. Why was this thing open to the public, let alone legal? One of the posters mentioned ‘exhaustion’ and how you need to eat more than you normally would. Enough said. We carb-loaded for the next four hours and wobbled off to bed. Apparently, a large portion of those deaths are from photographers just ‘backing up’… BACKING UP! As you can imagine, Charlotte and I are now apoplectic. We got back to our room, grabbed a thousand bottles of water and drove to the tourist center to buy maps. We were convinced to hike into this thing despite all of the warnings. We were not going to let this fear consume us. We had come all this way! Perhaps this is what the other 198 had felt. We had been told by our waiter the night before to try a trail a few miles east of our lodge (this does not sound like a valid source, but he had a beard and looked like a hiker, so..) When we approached the desk at the tourist center we proudly stated we were headed east. The lady looked up at us, quickly glanced at our yoga pants and sunglasses, and let out a small sigh. The same sigh that your mum makes when you leave the house without a coat on. ‘Is that wise?’ she seemed to say. She told us of a great trail closer to our lodge that might be better suited. Apparently there was ice on the eastern trail and very few places to refill our water. Our egos were bruised and our fears confirmed. But we were happy. This might be our last day on earth, but we were going to hike into this eroded lump of land and DAMN WELL ENJOY IT! After walking down the wrong trail-head for about 15 minutes we were finally faced with the correct one. First red flag. Our fears started to subside as we descended into the earth. The view was awesome – the original use of that word. It was unforgivingly AWEsome. Charlotte’s fingers started to swell and we were sucked right back to the notice board. I told her to lift her arms up and to keep going. I’ll admit, if there is adventure to be had I’m not particularly caring. Fat Fingers and I walked on, giddy with excitement. We managed to hike a mile into the crack and survive. As soon as we hit the first resting point we heaved a sigh of relief. We had not been hiking into a cavern of death and disaster, but had merely been a victim of mollycoddling. The national park, probably gripped with fear from law suits, had clearly posted a thousand warnings in case someone did indeed meet their maker sliding down the canyon. But for the majority of us, it’s just a lovely hike in the hills. When we realized we were not going to die, the climb became that much more enjoyable. Seven minutes later I slipped and landed a few inches from the cliff edge. 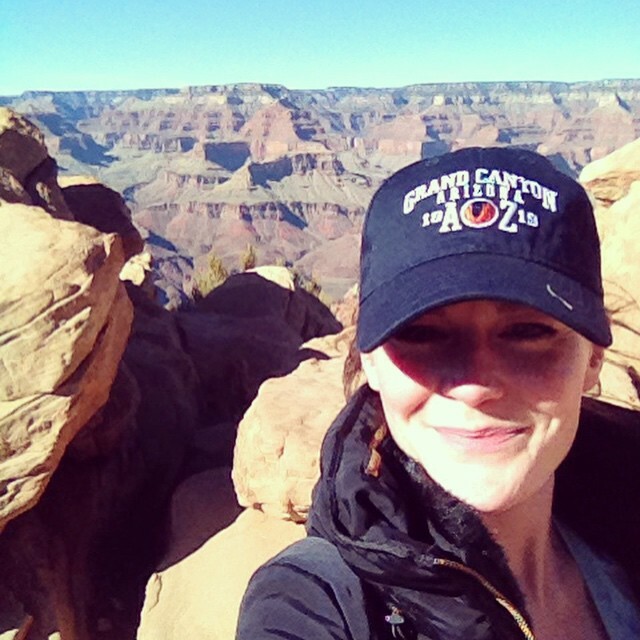 Charlotte gasped with a fear that only mothers have, and best friends hiking the Grand Canyon. Should I sue, I thought? No. I picked myself up and marched on. When we returned to the top three hours later we slumped down on a bench and waited for the bus to come collect us. We’d done it. The fear had lost. That night, we ate a bucket of pizza and apple pie. Naturally. No one died on this trip, and if they did it wasn’t me. Despite all of the red flags and warnings and carb-sweats, we survived, and witnessed one of the most incredible landscapes in the world. Never let fear ruin your adventures; there are so many beautiful places out there to see. After all, if something scares you it’s worth doing. Just don’t sue if it goes wrong.